Exclusive Autobulbs Direct H1 Xenon Ice Blue bulbs. The combination of Xenon gas and a specialised blue coating on the surface of the bulb has created these fantastic styling bulbs. The light emitted is a pure white light with the most distinct blue tint whilst staying road legal. These bulbs are great when colour matching to Xenon HID systems. These H1 ABD Xenon Ice Blue 12V 55W 448 Halogen Bulbs (Pair) would suit those who are looking for a great styling bulb that offers a distinct blue tint at a great price. They are also fantastic for people looking for a bulb that will colour match their Xenon HID systems. Ford Fiesta ST fitted with our ABD Ice Blue bulbs in the dipped beam and standard halogens in the fog lights. 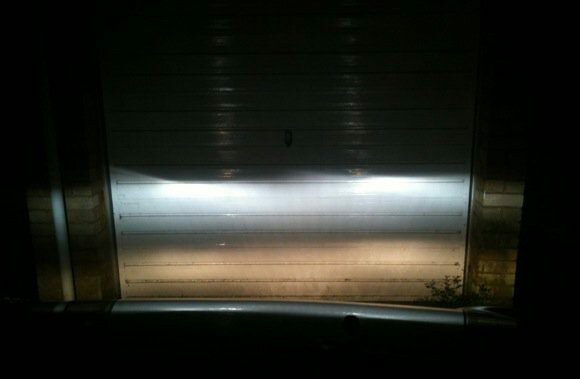 6500K Bright white light to match xenon HID systems"
in fact the light is yelow-ish like any other bulb. so waste of time and money buying this bulbs. Just what I was looking for. Vast improvement in vision. Very pleased i purchased these, make a great improvement from the standard bulbs...highly recommend! First class product for less than half the price of branded ones. White light with mint viewing ranging. Slight tint of blue from certain angles. 2nd set I have purchased this time for another car as I was pleased with them in the other car we run. Very bright and really lights up the road well. Tell you the truth !! Put bulbs in car !! Cannot see any blue tint what's so ever !! Really disappointed with this product you sent me !! Ice blue ?? No blue what's so ever !! Very pleased with 'em compare prices with philips or other bulbs i think these bulbs do the same job. Gives a very "clean" zenon-like visuel effect. Great product at a great price.